The Horrifying Hayride was our first experience of the night. Prior to coming we had heard so much about the new way we would experience this attraction but, we had no true idea just how much more real this journey would become. As we traveled through the darkness there were times the wagon itself would shift, shake, vibrate and move in ways that we would have thought impossible. Yet this was all happening and the experience lasted throughout the journey and not just during a single scene. If you want to truly feel what a new level of high tech sensory feels like then, the horrifying hayride at Jason’s Woods is the attraction to test for yourselves. Missing this trip would be a mistake worse than death! Next we made our way over to the outdoor walking experience known as “Lost in Jason’s Woods”. This attraction is truly unlike any other we have experienced in our time of seeing these attractions. You will make your way down twisted paths that will lead you deeper into the darkened woods where you will come face to face with those monsters that are to only dwell in your nightmares. You will enter the nightmares that only Freddy himself can bring to life. You will enter Camp Crystal Lake where Jason will be awaiting you and your friends. Werewolves and many other creatures of the night will be chasing you as you attempt to escape the horror that lies within what we have Ranked as “the #1 Haunted Trail in America!” Enter if you dare but, beware those who wait to scare! Our third stop of the night landed us among the terrifying clowns of the Carnival of Fear. We had no idea of all the fear that lied within. We were twisted and turned through this experience as we searched for a quick retreat that we thought would never come as we were pursued by evil itself. In this Carnival…you are the main event and they are out to get you. Hide if you must but, rest assured…they will find you and that is when it is too late for you! In the Chamber of Horrors, we saw things that sent chills up your spines only to leave you running in fear hoping that you would survive just long enough to find the end of this horrifying maze of fear. Monsters and demons lurk within these walls looking for their next victim. Closing your eyes and clicking your feet together will not help you to escape this truly terrifying experience that will leave you breathless…that is if you even make it out alive! Our fifth and final experience of the night was the Zombie Apocalypse. We saved this attraction for last. We could hear the screams of those being eaten alive by the Zombies that were hidden within hoping for more souls to make for meals. We did all we could to remain brave but, the darkness was holding the most horrible evils that gave us a true run for our lives. We never knew from what angles these creatures would come from. Above, below, behind or in front. They surrounded us to the point of begging for our lives. This is an attraction not to be missed and definitely not for the faint of heart! Jason’s Woods has received a 10+ out of 10 Scares Rating. We have also Ranked Jason’s Woods as a “Haunt Rater Approved Haunted Attraction!” which means that Jason’s Woods is one of the Top Haunted Attractions in the United States as Ranked by the Haunt Rater himself. 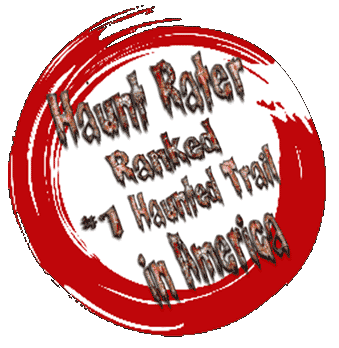 This is a High Classification and Rank that the Haunt Rater can give to an attraction. Jason’s Woods is the place to beat in 2016! A Home Run in our books and the only final words we can say is … THEY’RE BACK BABY!